I enjoy scrapbooking, when I’m in the mood. It easily becomes over-whelming because lately I only get around to doing it about twice a year. I have six albums I work on so the work multiples, everything from ordering more prints to keeping supplies well stocked. I have “the family album”, which is currently in its fifth volume and includes any pictures from friends and extended family. One album for each child- the oldest is on his fourth book, the middle on his second, and I’m determined to fit the baby’s first year in one volume! Plus I have an album for my husband’s sport/hobby pictures- skydiving, fishing, etc. And then I do pages of the family/kids and send them to my in-laws. Lately I’ve been thinking about switching to regular photo albums or maybe even digital to save time. But I’ll use up my supplies and keep thinking about that because scrapbooking is therapeutic for me. Let me count the ways. 1. I feel like I’m recording my family’s history, contributing to their since of worth in the years to come. 2. 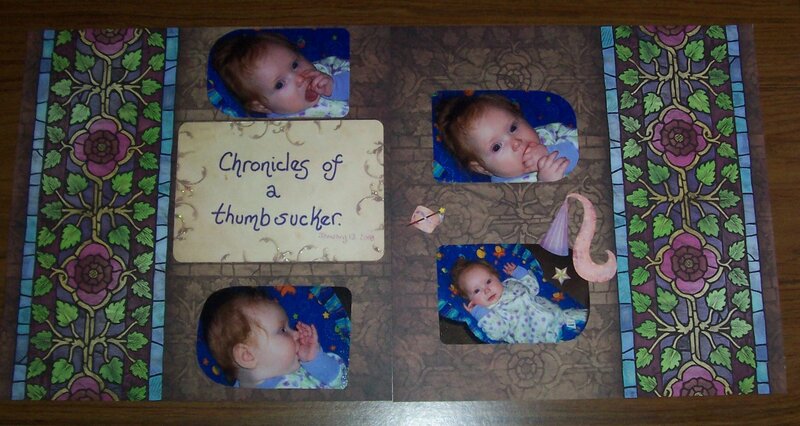 It provides a creative outlet as I craft a (hopefully) visually pleasing page of memories. 3. It’s relaxing to focus on the page at hand, temporarily neglecting the current issues looming above my head. 4. It’s nostalgic to focus on the milestones of rapidly growing kids. 5. It helps me remember that “this too shall pass”. 6. I feel like I’ve accomplished something as I see the albums get thicker. I’m not a master scrapper or anything. I rely heavily on decorative paper and stickers. (I only buy supplies when they are on sale.) But I think I do a decent job. I just caught up with my baby girl’s album- up through March 2009, which is the last time I ordered prints. Her album is extra fun because I’m doing a fairy tale theme throughout the pages, and for those who know me know I love castles and books. Five more albums to go! And by the time I’m done, I’ll already have several more months to catch up on from April 2009-whenever.